The Wheel Frame quilt block is designed on a 5 unit grid, so that it easily makes a 10" quilt block. (Note that I have also given you instructions for a 7 1/2" block as well as a 5" block). This quilt block is a good choice when you are moving on from the beginning stages of your quiltmaking journey, as it includes both the half square triangle as well as the quarter square triangle units. 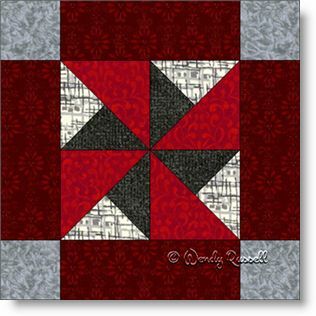 What is interesting is that, in this particular block, these quarter square and half square triangles are put together to form a unit which is often called a three-quarter square triangle patch. (See if you can pick these units out.) The block is sewn together as an uneven nine patch because the sections are not all the same size. The sample quilts illustrated are made using mostly the darker colours for the extra pieces in the quilt. This is a method often used when making a quilt for the men in your life, as they often do not like many of the lighter quilts. In any case, this block will look good in a light quilt as well as a darker one. You get to make the choice!